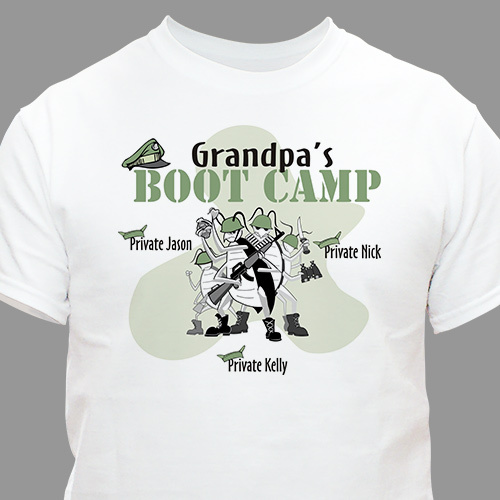 Your in charge of all your troops with our Boot Camp Personalized T-Shirts. Get them all into shape while providing plenty of required hugs & cookies throughout the day. A great Patriotic Gift Grandma & Grandpa will love to wear. Each Personalized Army shirt is Available on our premium white 100% cotton Personalized Shirt, machine washable in adult sizes S-3XL. Our Personalized Army shirt is also available in Ash Gray. Boot camp shirts include FREE personalization! Personalize your Army T-Shirt with any title and name. Personalized Army shirt makes an excellent military gift idea for dad or grandpa on Father's Day Gift! GiftsForYouNow.com has many Personalized Military Gifts for your favorite Soldiers. GiftsForYouNow also has a wide array of Personalized Patriotic Gifts for the 4th of July, Memorial Day and Veteran's Day.